As a rule, we don’t buy souvenirs for their usefulness. A t-shirt from the Hard Rock Café or a shell sculpture from Hawaii isn’t going to increase your productivity — in fact, dusting it may just make your life that much harder. But souvenirs are good things to have: they’re meant to remind us of the amazing experiences we’ve had. Your souvenir doesn’t need to be useful or productive. As you travel, there are many options for meaningful yet inexpensive souvenirs, which I like because that means I can save up and travel again that much faster. Personally, I also try to find souvenirs that I’ll have the opportunity to see in my day to day life, so that I have the benefit of my happy memories every time I put on a piece of clothing or walk by a pretty picture on my wall. Buy local clothing. Instead of picking up yet another t-shirt emblazoned with a city name, try for something that you’d be excited to wear. I’ve found gorgeous embroidered tops in Morocco, beaded sandals in Israel and a fantastic rugby jersey in Ireland. And because I managed to find places that catered to a local clientele, I could, at the most expensive, pick up an outfit for the same price I would pay at home. Find the local bookstores. I know plenty of people who like hitting up the local history section, but I prefer to find a couple of local authors who write fiction instead. My favorite find was a set of mystery novels set in Cardiff, written by a local man — I feel like I got a lot more local color than even a history of Cardiff could give me. And there’s nothing wrong with finding your local books at a used bookstore: local histories and such are notorious for rapidly going out of print, making a used bookstore a surprisingly good option. There’s nothing wrong with a keychain or a coffee mug, but there are so many options beyond the hotel gift shop. If you have any time to just look around your destination, and find a small market, a used bookstore or any other opportunity for truly unique souvenirs, I highly recommend it. As a note, I don't pick up rocks everywhere - only the trips and places that are the most special to me. 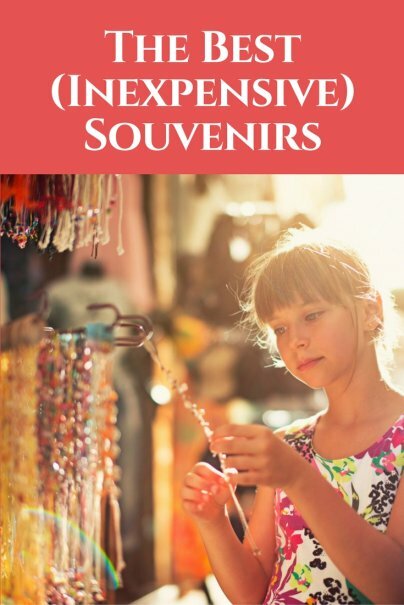 Those are some great ideas for getting souvenirs on the cheap. As a frugal traveler I would also include collecting actual pieces of the places you have been to. For example, sand from a beach, a pressed flower from a forest, a small stone from a mountain, etc. Of course you should make sure that this is safe and legal to do, first. I always try to find something that truly represents where I've been and reflects the culture or something I felt strongly about the place. This usually yields not only the best souvenirs, but usually the cheapest, too. Things like clothes, handmade paper, etc. are also useful once you're home again. You can elect to keep them as-is, or use them as they were meant. Those are all frugal suggestions. Two things we do in addition are textiles in general (sort of an extension of your clothing idea) such as table cloths, runners, blankets, carpets, etc, and street art that we can roll up in an art tube with a carrying strap. I'm totally with you on the photo thing as well. I have my fair share of rocks, sand and other bits of places I've visited. One word of caution, though: many places ask visitors not to remove such things because of problems like erosion. I like the tickets to bus and train rides and to the museums, parks etc the best as souvenirs. They are free, they are colorful, they remind me of all the fun things that I did during the trip. After coming home I usually arrange them together on my scanner and get a nice collage summing up most of the things we did during the trip. Usually it gets uploaded alongwith my pics to my google account. And there it is the colorful compilation of all we did, absolutely free and the best thing is that I don't have to dust it :) I usually trash the tickets etc once I have scanned them. My favorite is cookbooks--I can revisit the place by rereading them, and I often use them to recreate something when we're at home. If I buy anything, it's something I already need but haven't bought at home. Once it was a few plates, another time it was a dishtowel. then I actually use it. Photos are the best. I like taking photos that record the travel as well. From our way to the airport, and everything in between. The best are those pictures of just everyday life happening around while vacationing. They capture the real essence of the place you are visiting. When I travel, I love poking around grocery stores and farmers' markets to find local food specialties that travel well. I've brought back barbecue sauce from Kansas City, wine from Washington State, Everglades Seasoning from Florida, salad dressing from a vendor at the farmers' market in Hilo, Hawaii ... you get the idea. Lately I've also made it a point to find local artists' co-ops in the places we visit. A pair of earrings purchased from a local artist doesn't cost much, but it puts some money back into their community, and I can remember my trip every time I put the earrings on. prepurchase souveniers! For example, we were off to Orlando a few weeks ago. We didn't bring the kids along this time, but if we had...I would've bought some Disney stuff to take along with us and then would've handed the stuff out after visiting a theme park. We also saw many Disney items at the local flea markets (I don't know if that stuff was licensed or not)....I've even bought things at my local Goodwill and brought them along. As for me, my vote is for pictures. I've started now also taking photos of signs and markers. It helps in keeping things organized when you do an album later, plus no need to write where you are...cause there it is already! It works especially nice with some of those weather beaten and handmade signs. When we travel (rare occurrence), I like to carry my back pack and collect freebie flyers from places we go. Sometimes, you'll find a nice pamphlet in the lobby of your hotel of the amusement park or wherever you might go the next day. I collect up free maps of the park, whatever comes along. I take pictures of the kidlets enjoying themselves throughout the day. When it comes time to scrap book, I then have many resources to use on my pages- obtained for free. Sometimes, I'll just put a pamphlet in next to pictures of the place we had gone. Other times, I might cut the paper ephemera up. I figure that their PR person had an ace photographer take the picture- why should I waste my film or print paper? We also usually give the kids a certain amount each to spend on themselves- this way they can budget for what they want. I always make it a point to stop by the local Walmart or Walgreens... many times you can find t-shirts for the area you're visiting for a fraction of the price. Also, don't feel buy your items away from the attraction and you will save. We bought our South Dakota/Mount Rushmore shirts in Mitchell and saved 1/2 the price of what we would have paid in Rapid City. I also take lots and lots of photos. They truly are the best souvenirs. Send a relevant postcard with a few thoughts of what you've done that day to yourself. Kind of like a travel journal you mail to yourself a page at a time. I purchased a bottle of water in Dublin and did not drink it. Instead I packed it as a souvenir. I use filtered water at home and refill this unique water bottle regularly. It serves as a happy reminder of my trip. * a CD by a local musician or band a novel or book of short stories by a local author. Read or listened to on the trip, they can later become one of your most precious souvenirs, that - re-read and listened to for years to come or years later - will help bring back memories of the trip. Loan the book out or play the music to a friend or family member and they'll get a taste of your experiences. Books and music produced by local publishing houses and production companies are generally cheap too, especially in Asia and the Middle East. * supermarket souvenirs - unusual packets of gum or candy from Asia or mint tea, orange blossom water or rose syrup from the Middle East; spicy relishes or preserves, or even vacuum packed meats and cheeses from Europe. Give them away to friends and family, enjoy them together or savour them alone. We love to hit the flea markets where you can find wonderful vintage souvenirs!